At first glance, donkeys and horses look fairly similar. Although they do have some things in common, these two creatures are quite distinct. They both belong to the genus Equus, but you'll find them easy to tell apart. Horses and donkeys have a range of obvious physical similarities. They're both four-legged, hoofed mammals. They have long faces, large ears and long backs with tails at the end of them. Their eyes and ears are positioned in similar locations and they both have manes running along the tops of their necks. Despite their physical similarities, many differences also exist. Donkeys have visibly longer ears, while horses tend to have longer faces. The hair making up donkeys' manes and tails is stiff and bristly, whereas horses' manes and tails have softer and more flowing hair. 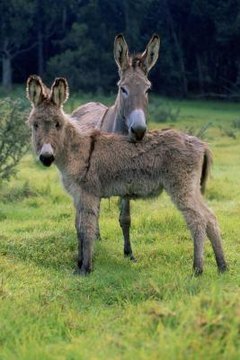 Donkeys have smaller hoofs than horses of a comparable size, and the frogs of the hooves are set in a more caudal position. Donkeys' backs are flatter than horses' and more often than not cannot hold a saddle. Both horses and donkeys are social creatures, but horses are naturally herd animals and prefer to live in a larger group, whereas donkeys tend to pair off and form a strong bond with just one other of their kind. Horses have an extremely strong flight response and will run from any perceived danger, but donkeys are harder to startle and will consider the risk before they decide to either run or stick around. Donkeys and horses differ on a genetic level: horses have 64 chromosomes and donkeys have 62. When a horse is bred with a donkey to produce a mule (male donkey, female horse) or a hinny (male horse, female donkey), the offspring have 63 chromosomes. Because of their parents' incompatible chromosomes, these creatures are generally sterile. So if you try to breed two mules with each other, you're not going to have much luck. What Is the Difference Between a Gaited Horse Saddle & a Western Saddle? What Is Different About a Horse & a Donkey? What Is a Reined Cow Horse?